The Ganesha Gallery, at the Four Seasons Resort Bali at Jimbaran Bay, is presenting an exhibition of paintings by Swedish artist, Richard Winkler. The show will run from August 19 until September 19, 1999. Images of the tropics, full of lush and exotic species of flora and fauna have long fascinated the western psyhe. 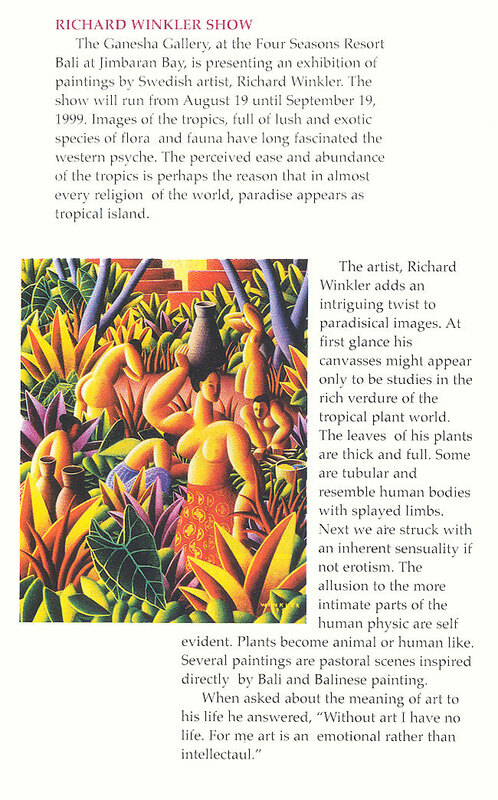 The perceived ease and abundance of the tropics is perhaps the reason that in almost every religion of the world, paradise appears as Tropical Island.